who should control students’ lunches–school or parents? Since I had several items over the last few weeks about the brouhaha in Chicago, IL, over a school prinicpal who banned sack lunches from home, I thought that I would share this item as well. He began, “Children learn a lot in school. Maybe more than we intend to teach them. CNN recently reported: “One Chicago public school is telling students they can either eat cafeteria food or ‘go hungry.’” No homemade lunches will be allowed without a medical excuse. 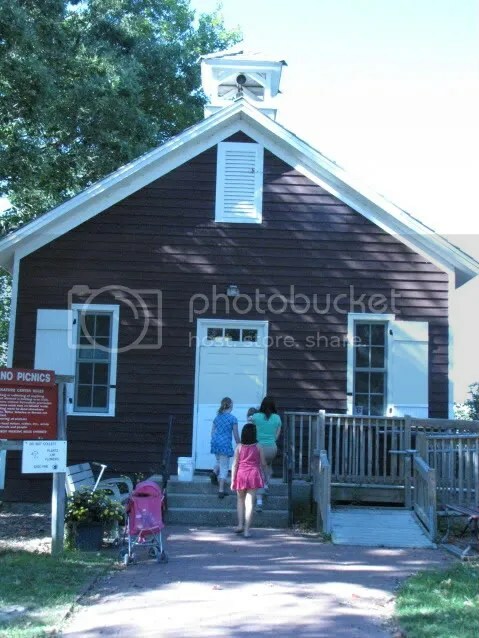 The “Little Red Schoolhouse” Nature Center 9800 Willow Springs Road, Willow Springs, IL 60480, is part of the historic past of Palos Hills in which it is more or less centrally located. Before the written history of man, Indian hunters followed the receding glacier that once covered northern Illinois. In 1804, there were two Indian villages near here. The school was built in 1886 to replace a one-room log cabin school — the first school building of the area. The Little Red Schoolhouse was originally located a little north of where old 99th Street joins the Black Oak Trail. In 1932 the school house was moved to Boy Scout Camp Kiwanis, and classes continued in this building until 1948. In 1952 it was moved to Its present site. In 1955 its doors reopened as a school, but in place of the three R’s, fascinating stories are told to children and grown-ups who visit here, stories about forest preserve plants and animals and the earth of which they live. Fifty years ago Longjohn Slough was merely a wet prairie where farmers cut wild hay. The land on which the schoolhouse now stands was a fruit orchard planted in 1906. All groups of 15 or more must arrange dates and make reservations by telephoning the facility at (708) 839-6897. For general information, call the Resource Management Department at (708) 771-1330; 1 (800) 870-3666; TDD# (708) 771-1190. Mark McWhorter, a homeschooling father and gospel preacher, sent me the following item on Sat., Apr 16, 2011. My response: It’s interesting that at least one person recognizes what the modern school system has become. As Sean Hannity likes to remind us, the idea that “all will be administered to each according to his needs and performance required from each according to his abilities” is Karl Marx’s very definition of the basis for Communism. So here is someone admitting that the modern public school system is basically a form of Communism! In an article on TownHall.com entitled “School Lunch Madness,” Bill O’Reilly weighed in on the issue of the Chicago school which forces children to buy school lunches rather than bring their own if they want to eat. He noted: According to an article in The Chicago Tribune, my standard lunch would not have been acceptable at the Little Village Academy public school in the Windy City. The principal, Elsa Carmona, is quoted as saying that her students can either eat the school cafeteria food or “go hungry.” Wow! Tough dietary deal. He continued: Predictably, Carmona’s edict caused an outcry, and now she says she was misquoted by the Tribune. Her lunch opinion is not a mandate, just a suggestion, she insists. But this story is not exactly an analysis of the federal budget. It strains credulity that the Trib got it wrong. What most likely happened is that Carmona took some heat from on high and is backtracking. Here are the comments which I especially want to emphasize: “But forcing parents to buy school food is going too far. This is nanny state stuff. I know that under President Obama the nation is heading in that direction, but it is now time to pause and smell the meatloaf. His conclusion: “The government cannot legislate good parenting, even though it has spent trillions of dollars trying. In an extreme example of the “nanny state” mentality, a public school in Chicago is forbidding students to bring lunches from home and is ordering them to only eat food from the school cafeteria. While the administrator makes the nutrition argument, former public school teacher Dr. Karen Gushta — research coordinator at Coral Ridge Ministries and author of The War on Children: How Pop Culture and Public Schools Put Our Kids at Risk — tells OneNewsNow it usurps parental authority. “It’s another effort to take away parental rights and the right of a parent to make decisions about what is in the best interest for the welfare of their own child, and place that right in the hand of an administrator or some government agent or whomever it may be,” she laments. The Tribune article also points out that the federal government pays school districts for each free or reduced-price lunch served — meaning schools that ban homemade lunches also put more money in the pockets of district food providers. What’s for Lunch? And Who Decides? At Little Village Academy, a public school in Chicago, the answer is Principal Elsa Carmona, who six years ago decided lunches from home must be banned. “Nutrition wise, it is better for the children to eat at the school,” Carmona said. She has obviously never met my wife – or any one of countless other moms and dads who go to great lengths to see that their children stay healthy and properly fed. “This is such a fundamental infringement on parental responsibility,” said J. Justin Wilson of the Center for Consumer Freedom, as quoted by the Tribune. And we heartily agree. But we are not surprised. In 2005 the Ninth Circuit Court of Appeals in Fields v. Palmdale School District determined that a traditional fundamental parental right “does not extend beyond the threshold of the school door.” (427 F.3d 1197, 2005) So, in Chicago the school can mandate that parents shell out $2.25 daily for a child’s lunch or let their child go hungry. Passage of the Parental Rights Amendment to the U.S. Constitution is a good place to start. By restoring the traditional standard of fundamental parental rights, we can begin once again to empower parents to make the good, healthy decisions for their children that they are currently not allowed to make. We believe, as the Supreme Court once said, that “[t]he statist notion that governmental power should supersede parental authority in all cases because some parents abuse and neglect children is repugnant to American tradition” Parham v. J.R., 442 U.S. 584 (1979). And that includes deciding what’s for lunch! On TownHall.com this morning, Marybeth Hicks had another article on the decision of a Chicago public school principal to forbid children from bringing their own lunches because, evidently, she believes that the nanny state knows what’s better for children than their own parents. Apparently, this has been going on for six years, and nobody has said much about it until now when a group of students and parents have finally started questioning it.